I was 12 years old and lived in Parkersburg, West Virginia when Earth, Wind & Fire’s classic album “That’s the Way of the World” came out in 1975. During the three years we lived there, I got a heavy dose of pop and rock but when “That’s the Way of the World” hit the scene, it was heard on every station. It was all I heard when I visited my family in Indianapolis and Chicago that summer. My cousin’s and I were blasting it on the 8-track on hot summer nights and everyone wanted to sing like Phillip Bailey on “Reasons.” Other hits on this album included “Shining Star“, “All About Love“, and “Happy Feelin’.” The album was actually the soundtrack from the movie of the same name which starred Harvey Keitel and EWF. The movie was pulled after three days but EWF released the soundtrack and the rest is music history. Their music ruled the 70’s and their concerts were spectacular events. I wished I was old enough to attend one of their concerts. “Shining star for you to see, what your life can truly be.” Enjoy your music. EWF’s new album “The Promise” was released on 05/20 and it is their first new studio album since 1997. This entry was posted on Friday, May 30th, 2003 at 6:15 am. It is filed under Flashback Friday and tagged with classic, Earth Wind & Fire, Flashback Friday, soul, That's The Way of the World. You can follow any responses to this entry through the RSS 2.0 feed. The Elements! Yes — Even though I wasn’t around in 1975 … I know and understand the feeling. The movie thing is new to me. How come it was pulled? Yeah back in the Day, when music had more than a heavy beat! EWF some what jazzie and brassie sound that smoked the places where played. I personally have a few good albums! I will have to listen to the new album, yes I know it is really a CD. you know why i love reading your blog? because i always find something new, new to me, or something forgotten that calls to mind a good memory. how cool is that? 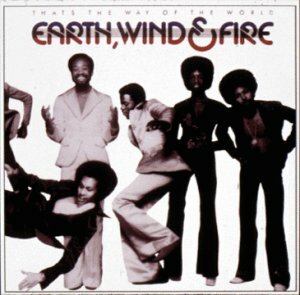 this EWF album is no exception. when this album came out, my mom took me with her to see them at the fabulous forum in inglewood. the lineup was EWF, Pockets (scroll down for audio clips), and (i believe) The Emotions. i was either 11 or 12 at the time and to this day, that concert remains one of my favorite music memories. equaled only by the jackson five, the landing of the mothership (1977 at the coliseum in LA), and almost all the prince shows i went to (can’t single out just one). i’ve caught up with all of my reading now after being immersed in work and am thrilled about the way EWF was written. i’ve listened to their albums, cassettes, 8-tracks, and cd’s for as long as i can remember. the fact that Maurice White has semi-retired makes me sad but, hey, with all of the music he’s written, produced, and performed (and i would be remiss if i didn’t add The Emotions in the mix) his sounds will live on for decades to come. I think I was 7 when this one dropped. My uncle, who was 6 years older than me, loved EWF and whenver I hear them I think of him. He was kind of socially challenged and once he got tickets for a EWF concert, but no date. She he was forced to take me. Man, I slept right through Deniece Williams because she was so boring! But, when Maurice White n nem came out, I was wide awake! That was the concert that Doug Hennings orchestrated and they all climbed in the pyramid, only to disappear! Magic. in ’75 i was nine . . . and i enjoyed their music then and i simply continue to adore them now – Earth Wind and Fire.